Do you ever get sketched out using your debit card? I am talking about situations where you think you might get charged extra fees. Examples include swiping your card through the Red Box scanner 50 times, purchasing an item online, or having a small business or mom and pop restaurant run your card through one of those tiny readers. These experiences are unnerving and makes us all worry that we might have much more deducted from our accounts than we should. There is one other big example of activity with debit cards that always makes me uneasy. Unfortunately, I engaged in it this weekend and my fears were realized. On Saturday afternoon Sidney and I were hustling to get to Turner Field for the Braves game. We took the Marta (Atlanta’s subway system) to the station’s main hub. From there we needed to hop on a shuttle that would take us to the stadium. Between where the train left us off and the shuttle, you had to walk through a portion of the Marta station called the Underground. This certain area was populated with built in shops on one side and then kiosks with people selling random junk running all the way down the walkway right in the middle. It just so happened that off to the side of one of these kiosks sat an ATM. I needed to get some cash in my pocket for the game. I didn’t want to wait until I got to Turner Field because I didn’t want to deal with lines, exorbitant ATM fees, or the hassle of finding the machines in the first place. Although this rinky-dink, stand alone ATM in the Underground looked sketchy at best I decided I wanted to take the risk in the name of convenience and I swiped my card. I answered the questions, entered my pin, and selected $100 as my withdrawal amount. I hit the final button and the machine made the money dispensing sound effect but no cash came out. Frustrated that I would not receive the convenience I desired and unsure about whether $100 plus the $3.50 fee would erroneously be taken out of my account I stood at the machine for a couple seconds with my mind reeling. A receipt then spit out that reported I had asked that $100 be withdrawn but that no money had actually been dispensed. I thought I was in the clear. 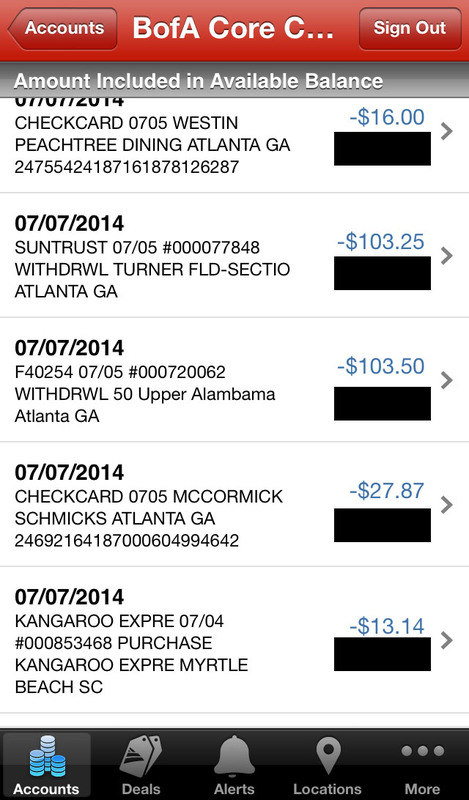 Sidney and I went to Turner Field, I used the ATM there, and I forgot about the failed transaction in the Underground. 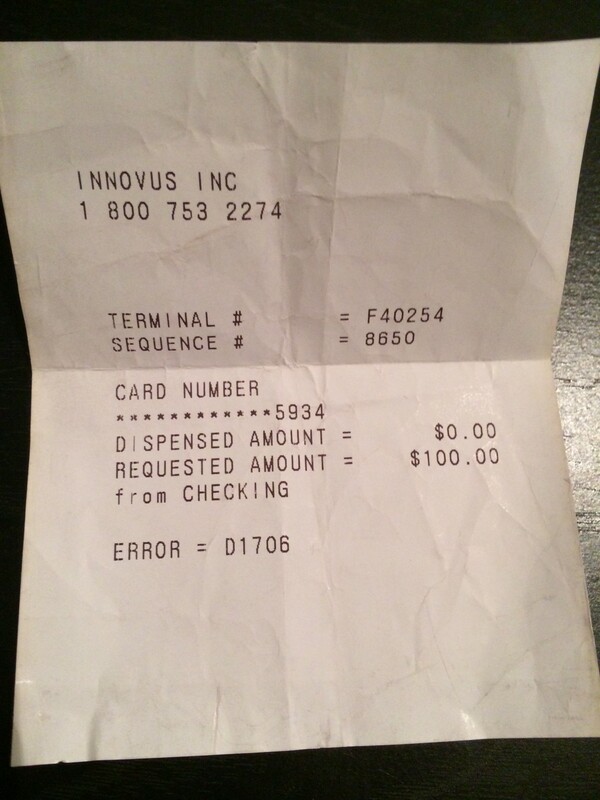 Here is the receipt I received documenting that I did not receive any money. Fast forward to last night where I decided to check my bank information. Yes, I don’t routinely check my account enough…I know it is a bad practice but I only pull it up about twice a month. I immediately saw two withdrawals stacked right on top of each other for $103.25 and $103.50 and I knew that piece of crap ATM had screwed me over. With it well past midnight and with the receipt that I still had from the ATM documenting that I had not received cash I decided to not get too worked up and just take care of the issue on Wednesday. The Upper Alambama charge is the one from the Underground and is completely bogus. “How did you get this number?” he asked me in an interrogative number. “Um, it is right at the top of the receipt,” I responded. After his rude interjection he asked me for the terminal number. Alright, we are getting somewhere I thought. I told him the number. “That number isn’t in our system,” he snorted. “Well let me give it to you again,” I responded and then gave him the number a second time. “No, that number isn’t registered,” he unsympathetically replied. “Um, okay, can I give you the sequence number or the error number also found on this receipt?” I asked. At that I gave him a piece of my mind and hung up. I called Bank of America (my bank) and told the representative my story. He treated me like a human being and a claim has now been filed. I will know in 45 days if I receive my $103.50 back. Point of my story is to avoid ATMs if at all possible. Especially ones in large cities in the subway station. The whole ordeal frustrates me to a degree but the Innovus rep I talked to today boils my blood the most. I might have lost a hundred bucks but I didn’t need to also lose my patience and dignity talking to a condescending jerk. I hope the claim wins out! Don’t Blink. This entry was posted in Uncategorized and tagged Atlanta, Innovus, Innovus Inc., Innovus Inc. ATM, Marta, Underground by brent. Bookmark the permalink. Good luck, Brent. I noticed on the withdrawal example you gave above, the address gave ” 50 Upper Alambama”? Did they mean “Alabama”? I mean, if it’s supposed to be Alabama, and they spell it Alambama, the company might be located in a foreign country! How frustrating and scary, really. And who has time for the run-around?